Enlarge / Google Chrome in macOS Mojave. 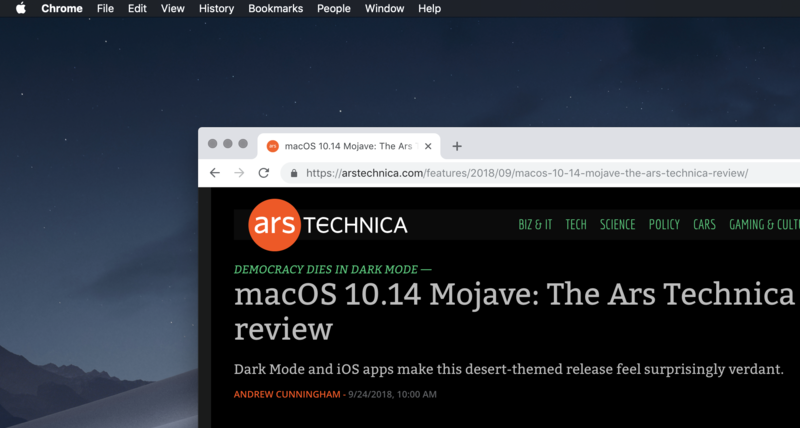 Apple added dark mode to macOS with its Mojave software update on September. Since then, third-party apps have been adding dark themes to go along with it, but there have been a handful of notable outliers, like Slack and Google Chrome. We’ve now learned that the latter of those will get a formal dark mode in an upcoming release, likely Chrome 73.
key, but it now must be false. Chromium is the first stop for changes to Chrome, with more steps along the way like the beta release, before the changes finally make it to the public release. Even in Chromium, the feature requires digging into code to activate, so this is early along. But dark mode is clearly on the way. Presently, there are third-party dark themes available for Chrome, but not all elements in the Chrome UI can be made dark in those. This update would add a comprehensive dark mode. The line in the notes about tracking the system’s dark mode status is also key. While third-party Chrome dark themes exist, Chrome would not detect when your system switches to dark mode and activate those themes automatically. Many popular apps (like Todoist) offer dark themes, but you have to manually switch every one of these apps after activating dark mode. Others, like Apple Mail, detect the system state. The latter is obviously preferable, as it saves the user some legwork. It appears that Chrome will take the preferable approach when this feature is released to the public.